Wouldn’t it be great if you had a browser extension that would block all the annoying ads that pop up onto your screen whenever you browse the Internet? AllstarAdBlocker seems to be precisely that kind of application, and it is not surprising that a lot of users fall for this trick. However, there is nothing useful and beneficial about AllstarAdBlocker. It is an adware application that DISPLAYS commercial ads instead of blocking them. You have to remove AllstarAdBlocker from your computer in order to avoid potential redirections to suspicious websites. While you are at it, make sure you terminate other unwanted applications as well. Do not be surprised if you find more than just one unwanted application on your computer. AllstarAdBlocker may have an official website at allstaradblocker.info, but the website does not function properly. This means that you cannot download AllstarAdBlocker directly, and this program ALWAYS comes bundled with freeware. Thus, it implies that when you install this application, you install a number of other applications as well. AllstarAdBlocker comes from a group of adware applications that is called the semi-random name family. It is practically the same as LuckyCoupon, SaveNShop, SharkManCoupon, etc. All of these applications get distributed via InstallRex installers, although in some cases they might come with Vittalia or Amonetize installers as well. Users initiate the adware download when they click fake download links on torrent or other p2p websites. It shows that you have to avoid download freeware from third-party sites; otherwise you will most probably end up installing more applications that you want to. 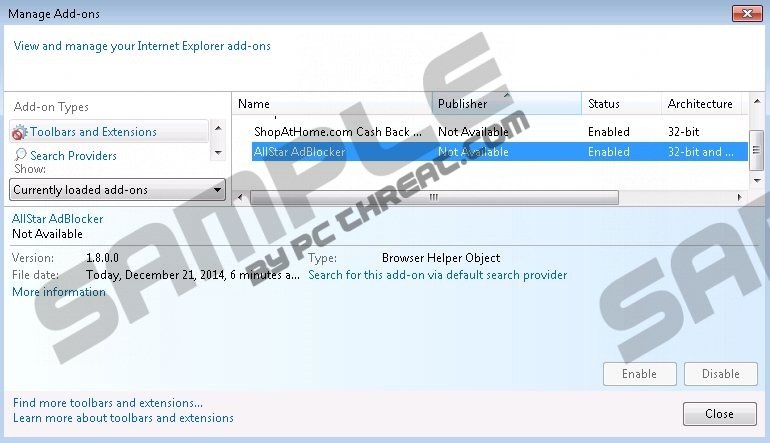 AllstarAdBlocker is compatible with Mozilla Firefox, Google Chrome, and Internet Explorer web browsers. It adds extensions to these browsers when it gets installed on your PC. Then AllstarAdBlocker starts collecting data on your web browsing habits. Tracking your web browsing history is not illegal, but the problem is that this information could be leaked later on to unreliable third parties. On top of that, AllstarAdBlocker might display third-party ads that have nothing to do with your most recent searches. It is important that you DO NOT click AllstarAdBlocker ads as they might redirect you to malware-related websites. To protect your computer from harm, remove AllstarAdBlocker immediately, and then delete the extensions from Mozilla Firefox and Google Chrome browsers manually. For a full system protection, invest in a reliable antispyware application. A computer security program of choice will also help you determine whether you have more unwanted programs on board. Do not hesitate to terminate them all at once, and should you have any further questions, you can always leave us a comment in the box below this description. Open Uninstall a program and remove AllstarAdBlocker. Go to Add or remove programs and uninstall AllstarAdBlocker. Disable and remove AllstarAdBlocker from Extensions. Select Extensions and remove AllstarAdBlocker. Quick & tested solution for AllstarAdBlocker removal.